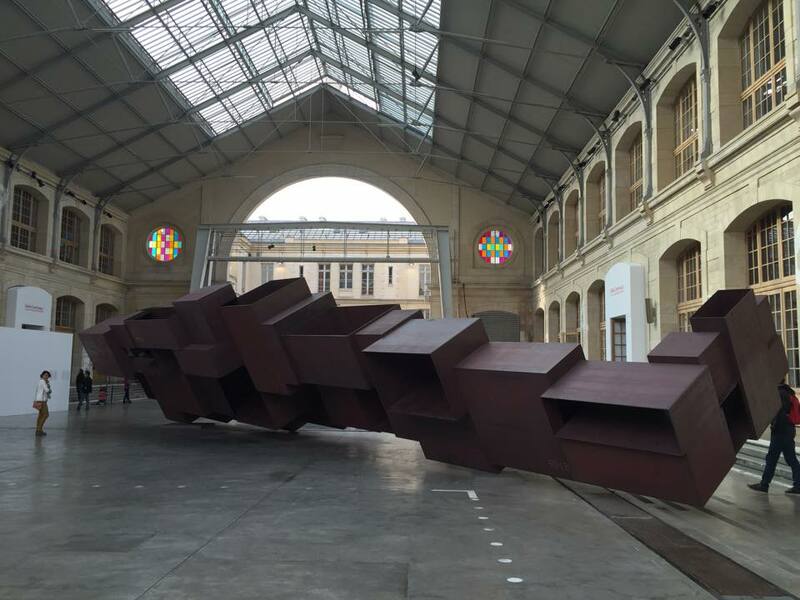 Displayed right at the center of the hall of CENTQUATRE-PARIS in the 19th arrondissement, Vessel has caught the sight of every viewer who visits the exhibition “Follia Continua! 25 years of Galleria Continua”. Designed by the famous British sculptor Antony Gormley, Vessel is made out of 39 interconnecting rectangular steel boxes. The material Cor-Ten steel, trademarked weathering steel, is a group of steel alloys which were developed to eliminate the need for painting. The use of this material allows the sculpture to form a stable rust-like appearance after exposed to the weather for several years. Vessel takes on the form of a gigantic recumbent man, which at first glance, may appear to viewers as a non-aligned work by Donald Judd. The series of box containers is an architectural structure of parts – the vessels that form a body. Yet it is in turn presented in a seemingly haphazard way inside the architecture that is made for the scale of man. Here the spatial definitions and purposes are blurred and unstable. The idea mediates on the renaissance trope of the city in the form of a man by making a man made in the form of a city. It provokes questions about the social and inspirational role of sculpture and its potential to provide direct bodily experience. This falls into the usual practice of the artist who is widely acclaimed for his sculptures, installations and public artworks that investigate the relationship of the human body to space. Born in London in 1950, Gormley has developed the potential opened up by sculpture since the 1960s through a critical engagement with both his own body and those of others in a way that confronts fundamental questions of where human beings stand in relation to nature and the cosmos. The artist continually tries to identify the space of art as a place of becoming in which new behaviors, thoughts and feelings can arise. The works of Antony Gormley naturally bring us to ponder on the anti-monumentalism (or Counter-monumentalism), a philosophy in art that denies the presence of any imposing, authoritative social force in public spaces. It rejects the notion of a monument developed from an elitist point of view as an emblem of power, an opposition to monumentalism whereby authorities establish monuments in public spaces to symbolize themselves or their ideology, and influence the historical narrative of the place. Artists explore the contemporary drive for creating memorials not of men on horses or mermaids in fountains, but for everyday people and tragedies. By the same token, we could see that Antony Gormley explores the relation of the human body to space and moments in time through his sculptures, installations, and public artworks. Over the last 25 years, Antony Gormley has revitalized the human image in sculpture through a radical investigation of the body as a place of memory and transformation, using his own body as subject, tool and material. He used a cast of his own body as their starting point and for his large-scale, outdoor installations such as Angel of the North (1998) and Another Place (1997). In Event Horizon (2007), which has been shown in London, Rotterdam, and New York, Gormley sited 31 body forms atop rooftops, riverbanks, and sidewalks within the dense urban environment. In One & Other (2009), a project for the Fourth Plinth in Trafalgar Square, London, he invited members of the public to create their own artwork on top of the plinth for one hour time slots over a period of 100 days. At the moment, his other two works the Big Spin (2014) and the Big Look (2014) are presented by the Galerie Thaddaeus Ropac, Salzburg, Paris under the Hors les Murs programme of the FIAC 2015. These works from his BIG series pursue his study of the body and space, whereby the artist questions the body as a site, and space and scale as the principle factors which condition our understanding of our environment. These sculptures disorient the spectator, provoking a process of self-observation. 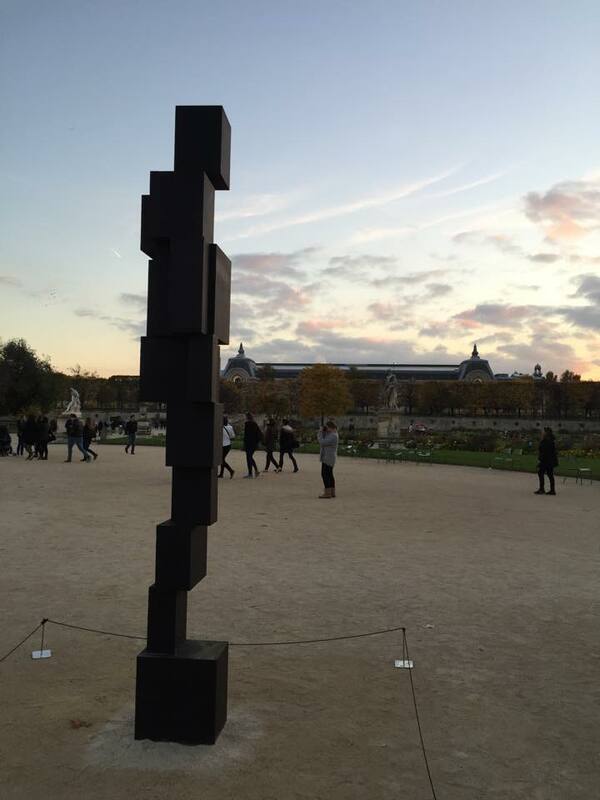 Their presentation in the Tuileries gardens is a continuity of Antony Gormley’s practice in which each exhibition is considered a site of physical and psychological experimentation. We would perceive the artist’s works as not in the normal sense of being a representation of the subject. Rather he is trying to arouse the interest about what the nature of the space a human being inhabits is. What he tried to show is the space where the body is, instead of what the body itself represents. The project, Event Horizon, is scheduled to be unveiled in Hong Kong on November 19 and will last until May 18, 2016. Nevertheless, it has already proved provocative during the two years it’s taken to bring the statues to the city. The statues were meant to have been displayed last year, but Hongkong Land pulled out as main sponsor after a J.P. Morgan employee jumped to his death from the roof of a Hongkong Land property in February 2014. Some news reports quoted unnamed sources saying that J.P. Morgan was of the view that having Gormley’s life-size statues placed on rooftops would be too much of a reminder of that particular tragedy. The idea of Event Horizon is to prompt Hong Kong people to pause amid their daily rush and to take a good look at the details of what’s around them. It aims at actualising the art’s value – its ability to stimulate thoughts that were lost or thoughts that would otherwise not exist at all. It is true that in a smartphone-obsessed city, the population in Hong Kong rarely takes a look at the details around themselves anymore. In another sense, the project is also about how human will overcome extreme adversity. It is very much about the place of individuals against forces that are faceless determiners of our lives. The decision to display the statues in the central business district may not be to everyone’s taste, since the area smacks of exclusivity and may reinforce the link between art and the market. That said, it is certainly a sound demonstration of the challenge of stereotypical views and unexamined values.